Summer and ice cream; they are meant to be together aren’t they? For me the quintessential treat during the summer is an ice cream float; that creamy, fizzy combination that is reminiscent of summer days of my childhood when my dad would bring home a gallon jug of soda and some vanilla ice cream and we would drink our dessert. I still love an ice cream float but I also love discovering flavor combinations beyond those early years and today find myself more often with friends than family so something creative is always fun. While I’ve often hosted ‘Girls Nite In’ events for friends over the years, this one was a bit different. My home is not quite ready for a big bash; sod was just FINALLY put in a bit over a week ago so I kept it small and invited some of the women I’ve met in my neighborhood over for a Sunday afternoon get together. The big difference this year is that daughters were invited! I knew that my signature ‘cocktail’ would have to be both light and something that could be made as a mocktail for the girls. Inspiration comes in many forms; as I was heading to the grocery store to purchase a bottle of Trop50 Raspberry Acai and some vanilla ice cream, I passed a local Sonic drive thru on the way; I’m still discovering my new neighborhood and this discovery was a delight. Two things I love about Sonic; their ice which I buy by the bag because I love it so much and their Cherry Limeade sodas. That was all it took for me to change direction for this post. I love the combination of sweet and tart and decided to make something similar using the Trop50 Raspberry Acai and Lime Sherbet. The fizz? A touch of Prosecco for the moms and club soda for the girls (and a pregnant mom too!). 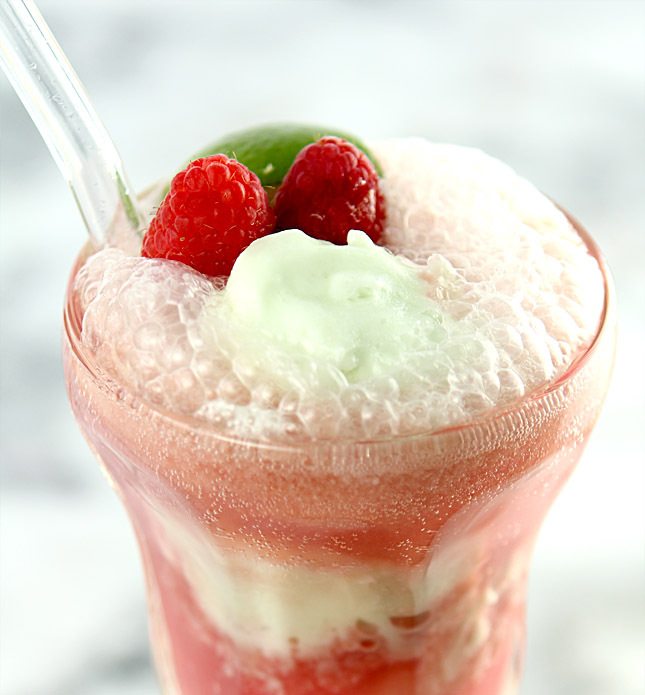 My Sparkling Raspberry and Lime Float was a huge hit; lower in calories but still an indulgent treat. I served it with some easy snacks including popcorn, mini ham sandwiches, a fresh fruit salad and cookies. 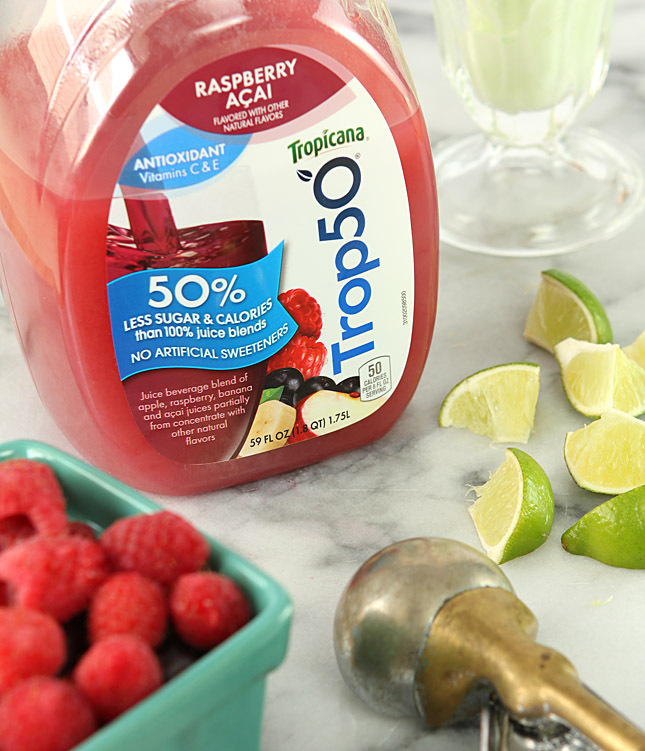 I love that Trop50 has the great taste and goodness you expect from Tropicana, but with 50% less sugar and calories and no artificial sweeteners. Adding it to sherbet with just a touch of club soda or Prosecco kept it light…even though I think seconds were had by all! Want to host your own Girls’ Night In? Head over to the Girls’ Night In theme board on Pinterest or to Foodie.com for “Inspiring Ideas for a Girls’ Night In”. But wait! There’s more! If you have a favorite Girls’ Night In key element (of your own or from your favorite blogger) you can enter the Trop50 Pinterest Sweepstakes! Pin your favorite Girls’ Night In essential for a chance to win one of five $300 VISA gift cards. Official rules here for this FAB #GirlsNightIn opportunity and enter by selecting or adding your favorite key item below for your chance to win! Chill glasses in freezer for 15 minutes. Put scoops of sherbet into individual glasses. Wow! As if you weren’t the *hostess of the hood* already, serving cocktails and mocktails like this is certainly going to spread the word quickly that your home is *THE PLACE* to gather for good food, good drink and good company. I so remember Coke floats and root beer floats from my childhood. I grew up in a small town and the local drug store had a soda bar that served Coke floats. You version looks fantastic and thanks for reminding me of those fond childhood memories. Great post! Thanks Bill and even though I’m not from the South but the Midwest I can remember so fondly those same wonderful places. This is a bit different, a bit lighter and well, with Prosecco maybe a bit more adult too! The child who lives inside me is thrilled with this. What a fun way to meet everyone. sounds like you found a great spot and are settling right in. I never did too many girl’s nights but that doesn’t mean I’m too old to start! We will have one here! Assuming the weather ever warms a bit. Come ON spring! This is so pretty! I love it when the virgin version is as good as the hard version, dare I admit that I actually prefer a virgin colada over the pina version! Wish I lived in your neighborhood, lucky ladies! By the way whats so good about Sonic ice? Your new neighborhood sounds like it is filled with sweet neighbors– I am so happy you are settling in and enjoying your new home. Looking forward to visiting next week! Yes, so far so good! I’m looking forward to it too; I almost thought of asking others but sometimes I just like to catch up and that’s what we will do! Either version looks refreshing and delicious to me. So glad that you are getting to know your neighbors. This summer will be a nice opportunity to share your delicious creations with them. Lovely! Did I miss something? What is lime sherbet please Barbara? Now you know lime, you should experiment! I love that it’s lighter than regular ice cream and works well with a lot of fruits. Well, I don’t think hosting a “Girl’s Night In” is in the card for me. 😉 But maybe Mrs KR would like to! I’d gladly hide in the kitchen and snarf one of these while the party was going on!